~60 miles 8,000 ft. elev. This loop is big, we won’t lie. We have routed it so you climb from Ashland up Tolman Creek Rd. (2080) because it is a more gradual climb. Alternatively you could climb Ashland Loop Rd. (2060) of which most is closed to motorized use but has some steeper pitches. Either way you’ll end up on the 2080 which T’s into Ashland Ski Rd. where you turn right and climb up to the lodge. Shortly after passing the lodge the pavement ends and the road narrows. The PCT zig zags FR 20 for the next 10 miles. After climbing away from the Grouse Gap shelter you’ll descend a narrow rocky road with just enough evidence the see that it was once paved. Just as that road begins to flatten out (mile ~24) you’ll see Wagner Creek Rd. (FR22/NF-2040) to your right. This is a good place to assess how you and your riding partners are feeling. 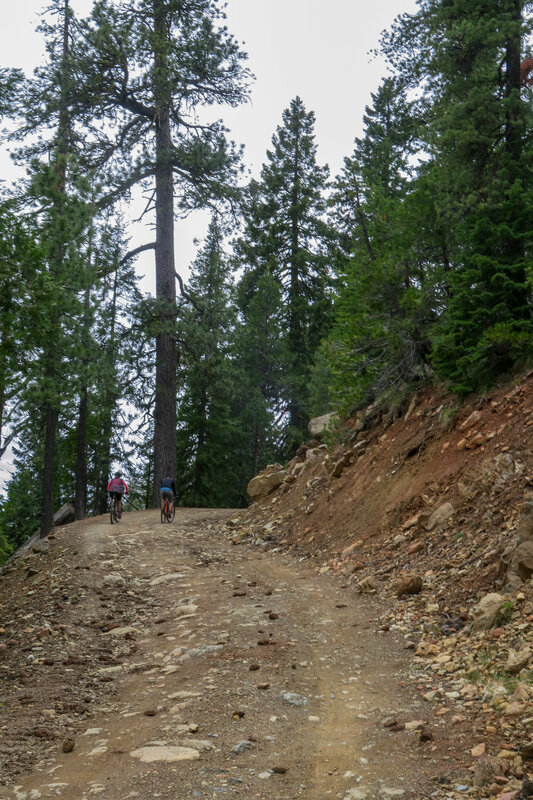 You can cut out ~10 miles and 2k ft. of climbing if you turn right on Wagner Creek Rd. Otherwise, continue towards Wrangle Gap (mile ~27) where you will turn right onto NF-2030. This road takes you past the Wrangle Gap campground “dispersed” (no fee, limited facilities, just a pit toilet) site. Shortly you’ll be descending on a baby head strewn narrow road that is rougher than most roads in our region. At this point you’ll be thanking yourself if you rode a mountain bike. 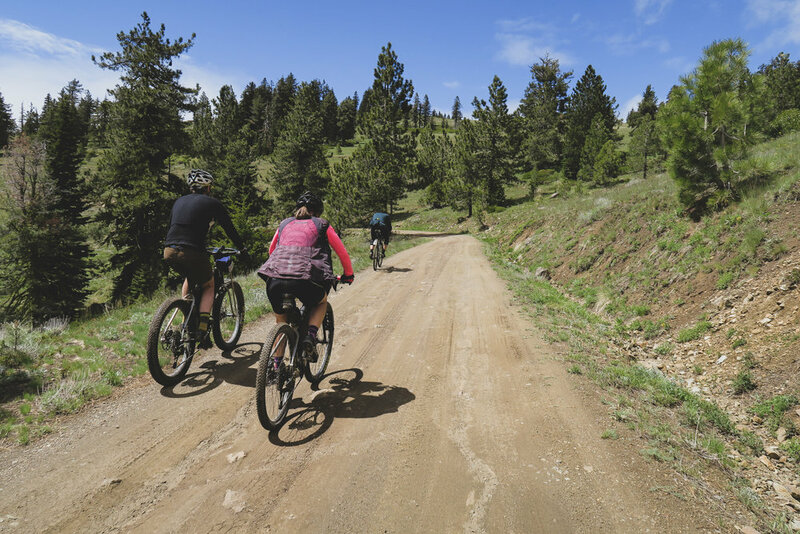 If you road a cross or gravel bike you’ll be doing your best to see the road ahead of you despite your eyeballs and brain being shaken violently. Not to worry because the rowdy section of the descent isn’t too long. Garvin Gulch (mile ~33.5) would be a good spot to stop, shake out your arms and filter some water before continuing down into the Little Applegate drainage. Don’t miss the right turn onto Brick Pile Rd. at mile ~35 otherwise you’ll be adding some more miles and climbing onto this already zesty loop (or if that’s your thing then go for it, I would suggest the Sterling Mine Ditch trail if you really want to go big). Brick Pile will climb out of the Little Applegate and up to Wagner Gap. At this point you’re practically done climbing. Descend into Talent on Wagner Creek Rd. and take the Bear Creek Greenway back to town. Bring more than you think you’d need and a water filter. There is a fountain at the Mt. Ashland Ski area but it is not always turned on. There are streams along the route, that in years of good snow pack flow year round but don’t bank on it. Even in dry years we have found water between Bull Gap and the Mt. Ashland Ski Rd. Most reliably available spring on the crest is Sheep Camp which is slightly off route (2 miles past Wrangle Gap on FR20). Take the Eastview Trail at mile ~8.5 for a little extra flavor, you’ll end up back on the 2080. Make it an over nighter by camping at Mt. Ashland campground, Grouse Gap shelter, or Wrangle Gap campground.